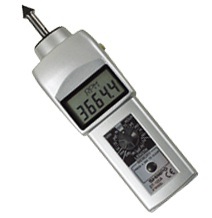 Shimpo’s microprocessor technology has heralded a superior standard in tachometer accuracy and capabilities for measuring and recording rotational/linear/surface speeds and total length. Offering unprecedented confidence via new improvements, the DT-105A and DT-107A battery-operated tachometers still feature the same rugged, high quality components that have made them the benchmark in the industry. These user-friendly, value-packed units feature expanded memory storage, added length functions, free N.I.S.T. certificate and many standard accessories. One year warranty.